By now in fashion, we know one thing for sure, everything always comes back in style ! From the 30's to the 90's every decade has it's comeback moment. Right now, it's the 70's that are all the rage in trends. We love this period for it's typical warms colors and easy-going clothes. Here is our top 10 of 70's trends to embrace - again ! It's been a while now that bell sleeves are in style but it's never been as popular as right now. These sleeves are bigger and bold than ever and we just love the boho aspect of this trend. 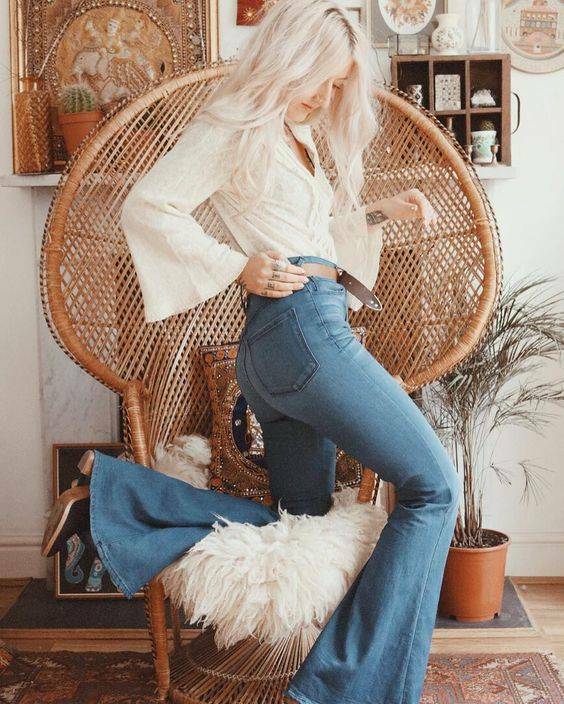 We first learned to love crop tops with the return of the 90's but now it get's a bit of a twit with a knotted that transport it right into the 70's. The result is charming and super cute. Here, the goal is to choose pieces of clothing that have exactly the same patterns AND to wear them at the same time ! Choose pieces that are more close to the body to avoid a pajamas like ensemble. We adore this trend for it's comfiness and simplicity. You juste pick a t-shirt with a caption you love or an illustration and that's it ! Pair it with high wasted jeans for an even more 70's inspired #ootd. Whether it's in the top or in the bottom, chose a dress that has a certain volume to it to get that free-spirit vibe. Plus, you'll be super comfortable on hot summer days with a little room to breathe. From jeans to dressier pants, opt for a high wait to really get that look we want. then, tuck in your t-shirt in your pants - we're talking half-tuck here - to be super comfortable and trendy. Everyone will love this trend, even the moms ;). No need to convince us to wear flowers; we are ALL in ! From a pretty flared blouse to a chic little dress, the floral pattern must make his entry into your wardrobe. If you're not sure about pulling it off, opt for a smaller scale pattern that will be less bolder than those big typical 70's flowers. There's nothing easier and more comfortable than to put on a one-piece ! With only one piece of clothing, you have your whole outfit planed. Over-alls are also coming back in style, so pick your favorite and enjoy the simplicity of it. Whether it's vertical stripes or horizontal stripes, everyone has at least one striped piece of clothing in her wardrobe ! Elle, now is the time to bring it back out again. If you are starting from scratch in the stripes department, choose colorful ones that really dictates a 70's aesthetic. Let's not forget amour jewelry that can make of break your whole outfit. For this trend, natural stones and gold finishes are on top of the line when choosing jewelry. Superposition is also super trendy for rings, bracelets, necklaces and even earrings ! It's also the time we've been waiting for : Hoops are back !! Let's get groovy with those ;). Copy the looks above ! Have a good shopping trip !